For many years Cooley was the LDI/MGP of Ireland, semi-anonymously cranking out spirit for brands without distilleries as well as its own. That changed in 2012 when it was bought by Jim Beam, who massively scaled back contract sales to keep more of the production for their in-house brands. Some casks did find their way into the hands of independent bottlers, though they are becoming increasingly uncommon. This whisky was distilled on November 24th 1995, filled into a bourbon cask (size not specified), then bottled on March 19th 2012 in an outturn of 193 bottles at 56.7% without coloring or chill filtration. Nose: rich malt and bourbon cask notes, herbal/floral notes around the edges. After adding a few drops of water it becomes softer and more malty, but otherwise unchanged. Taste: thick malt and cask strength sweetness throughout, orange and lemon peel with hints of berries in the middle, mild oak into the finish. After dilution the sweetness becomes much stronger with less assertive oak until the back, and it becomes simpler overall. While there are things to enjoy about this whisky at full strength, I find it too hot and cask-driven to find much subtly. The thick mouthfeel is a big plus, but there isn't a lot of evolution and the finish more or less recapitulates the flavors. Might hit the spot if you're a Glenlivet Nadurra fan, but that one never hit the mark for me either. This is a simple, straightforward set of aromas and flavors. While enjoyable, it doesn't have a lot of complexity and I wouldn't have found the whisky very compelling if it had been bottled at this strength. Not bad, just nothing that I couldn't find from any number of bourbon cask Speysiders. Dang, that was a lot more than I was expecting. Unlike at full strength this is a fairly subtle whisky at this dilution with most of the action happening in the finish. Also surprising is the comparative lack of oak, considering that its heavy presence at full strength. Almost makes me wish this had been bottled at 46% because I think I would have enjoyed it more that way. One of the questions I see asked very infrequently in the spirits community is "Do I already have enough?" The almost unquestioned assumption is that more is always better. When individuals are receiving literal pallets of whisky, it's time to serious ask ourselves where the line should be drawn. There seem to be a number of factors driving this unrestrained acquisitiveness, but social media is a major piece. Before ubiquitous internet connectivity someone who accumulated a significant collection might be able to impress friends or family after a fashion, but beyond a certain point they would have seemed, at best, eccentric. With the advent of spirits blogs, forums, Twitter, and Facebook groups, the bragging not only reaches a wider audience, but makes it possible to show off for a selective audience who will appreciate and validate increasingly large collections. During my time participating in online spirits groups, I have almost never seen anyone asking how people with vast collections will manage to drink everything they have bought, even when they reach a level where it becomes infeasible for the owner to consume everything during their lifetime. We're talking about collections that go beyond the hundreds of bottles and into the thousands. Many of those bottles owned by serious enthusiasts will be cask strength, representing upwards of 50-60% more alcohol than the standard 80-proof spirit and thus far more units of alcohol. These online groups seem to create a cycle of validation where people convince themselves that their own acquisitiveness is justified by praising others who are doing the same thing. I have witnessed this go to astounding and genuinely harmful lengths, as some folks purchase spirits in volumes that negatively impact the rest of the life, all the while being praised by their peers. And much like the social pressure to omit negative opinions, there is pressure against questioning the volume of those purchases, even when they are clearly pathological. While some of it is the general caution of calling people out, it is also difficult when so many of us are following the same path to one degree or another. Another major driver is the fear of scarcity. People hunt down 'limited' releases or buy cases of expressions they believe will change or become unavailable over time. But for many it's not enough to buy one bottle and enjoy it, they have to get as many as possible. For some that's to resell to the highest bidder, either to make money in general or to fund their habit. For others it's creating a 'bunker' to ward off the possibility that they will never again be able to buy good spirits at reasonable prices again. For others it's simply the ability to gloat at the 'suckers' who weren't bright enough or lucky enough to stock up. The question we all need to be asking ourselves is how much we're really going to be drinking. Can we consume what we're buying in a reasonable timeframe without putting an undue burden on our livers? Do we host enough events to share our purchases with likeminded friends? There will always be more that you want to drink than you have time, money, or liver for. While Cambus has acquired a gloss of renown due to being a 'lost' distillery, the mystique seems peculiar given that it was what every other grain distillery has always been: a factory for churning out alcohol. While it is more reasonable to bemoan the loss of malt distilleries with unique characters, the range in grain distilleries seems to be far more limited, as they used very similar production techniques and equipment. With that said, this whisky was distilled in September 1988, filled into a refill hogshead, then bottled in July 2015 at 48.0% without coloring or chill filtration. Taste: lightly sweet grain throughout, berry overtones beginning early and carrying through, creamy mouthfeel, very little oak at the back. After dilution the grain component becomes stronger and the berries are less pronounced, it's sweeter overall and a bump of baking spices show up near the back. While without that sample's flaws, this fits into roughly the same mold as the Pearls of Scotland Cambus I tried of the same vintage. There's nothing about this that stands out from any other grain whisky I've sampled, so I'm not sure there's a lot of reason to recommend it. The best character of this is the berry notes on the palate, which might mesh well with a floral malt, but I need to futz around and see. For all that certain corners of the whisky world are trying to hype grain whisky as the next big thing, very few of them have genuinely impressed me. I buy them largely to further my efforts at making my own blended whiskies, where their lack of strong character can be an asset rather than a flaw. 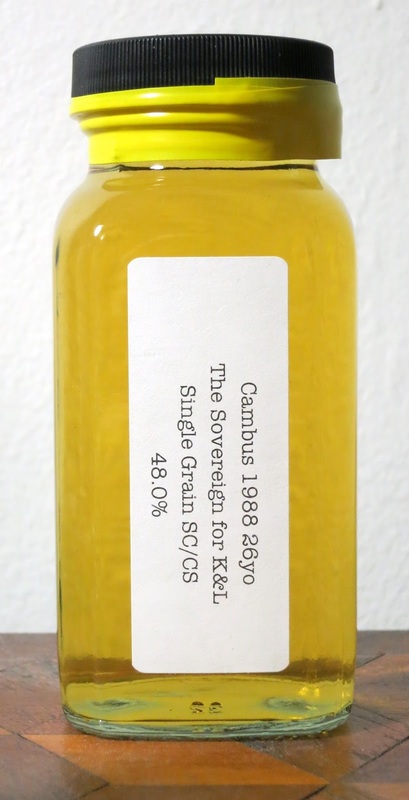 If I get more Cambus it will be one of the sherry casks that should provide some more interest on top of the usual grain character. It's a tricky time to be a spirits enthusiast in America. While spirits are more popular now than they've been since the 1970s, the last handful of years have created a lot of new wrinkles. First, the good. In some respects, there are more options than ever. Distillers are releasing new expressions on an almost daily basis and (some are) paying far more care and attention to their products than they did when they were effectively producing commodities. Entire categories of spirits that would have required huge amounts of legwork to source fifteen years ago can now be found on back bars and liquor store shelves across the country. Many retailers have expanded their exclusive release programs, offering options that can't be found elsewhere and increasing diversity. The internet is full of people talking about spirits, which makes finding information easier than ever. Clubs and tasting groups have sprung up in every state. And for those who care about such things, spirits are cool, giving the drinkers a caché that hasn't existed since the Mad Men era. But not all is well. Popularity is a fickle beast. For those who had knowledge and connections during the 1990s and early 2000s, options may seem extremely closed off as stocks of old spirits have become severely depleted. What once went for a song is now many times more expensive as competition increases. But these are the effects of the market - large, primarily impersonal forces outside of individual control. More complex are changes made at the level of state and national governments shaping the American market. While many more American liquor stores now sell their stocks online, shipping them across state lines has become an increasingly fraught task. Many states flatly refuse imports into or exports out of their borders. In some cases this is due to state monopolies on liquor sales that do not want to give up control. In others it is about protecting the interests of local distributors, who wish to ensure that they get their cut from liquor sales. In 2010 efforts were made at the national level to tighten these regulations further and make it easier for states to restrict cross-border sales, but thankfully the bill did not pass. In the meantime, some states, such as Kentucky, have taken it upon themselves to restrict internet sales, closing off once-popular stores such as The Party Source that previously shipped across the country. Binny's Beverage Depot, a major Chicago area chain that has a vast exclusive single cask program, announced that once again it was no longer able to ship spirits outside of its home state. While a previous clampdown on interstate shipping was resolved, it's currently unclear if or when this will be reversed. From this vantage it is not clear whether the issue is state regulations or the national logistics companies, but either can be a problem. Even the much-vaunted K&L Wines in California, which has a significant local market to sell to, is fairly restricted in which states it can ship liquor to (for better or worse, Oregon is not on that list). The lack of a legal secondary market for spirits has also complicated the situation. While there are compelling arguments that secondary markets only serve to encourage speculators, the demand for limited releases, especially of bourbon and rye in the States, is practically insatiable. While any number of attempts have been made to localize and regularize these sales in some fashion, whether through Facebook groups or auction sites, many have foundered on the fundamental fact that liquor sales through any channel other than an authorized retailer are flatly illegal throughout the country. So far many the more visible efforts have either shut down or folded on their own. This is in stark contrast to Europe where numerous auction houses and websites host sales on a regular basis. There are hints that this may be changing, with Kentucky now allowing licensed retailers to buy and sell 'vintage' spirits, though it is unclear how that market will evolve. While this makes life more difficult for flippers and drastically reduces the liquidity (heh) of the market, it also means that getting ahold of limited releases is often more about legwork and relationships than money, because even the biggest bank account may not let you find someone willing to part with a particular expression for cash. On an international level, January 2013 saw the temporary cessation of spirits shipping from the United Kingdom to the United States, due to a change in Royal Mail's policies. While workarounds were eventually discovered, shipping prices rose dramatically as a result and have remained high ever since. To cite one example, shipping spirits from a well known store like Master of Malt to Fiji costs the same as shipping to the United States. While this does not entirely foreclose that source of spirits (I have heard suggestions that this has become a more popular source for American enthusiasts), it does make them much more expensive and difficult to justify as values, even after the post-Brexit tumble in the pound. The fractured nature of the liquor market in the United States and frequent lack of alternative channels can make it difficult to sustain enthusiasm. Especially for folks living in control states with limited selections, the itch to try new spirits can be extremely difficult to scratch without creative legwork. Even for those in broader markets like California, it can feel increasingly difficult to find bargains as prices rise and once-prized expressions disappear from circulation. On the flip side, there are some, especially bourbon fans, who find that the chase (even when it slips into quasi-legal territory) is now a big part of the fun. The thrill of slipping one past the powers that be is not insignificant, but trying to evade regulations comes with a host of risks ranging from packages impounded by customs, to buying fakes from unlicensed sellers, to criminal prosecution in the most egregious cases. Knowing where to draw the line, especially when official standards are hazy, is difficult. Unfortunately it appears unlikely that this situation will change anytime soon. While there are some efforts to legalize direct sales across state borders, there are a large number of interested parties vested in the status quo, ranging from distributors to state monopolies. It will take pressure from below to budge lawmakers into loosening the grip of distributors and other intermediaries in the three-tier system, let alone making legal alcohol shipments from other countries easier and cheaper. Shieldaig (in the States) is a line of mystery malts and blends bottled for the Total Wine chain by Ian Macleod (an independent bottler and owner of Glengoyne and Tamdhu). While you will find plenty of speculation where this single malt is sourced from, it's probably fruitless as sources may change and the profile is unlikely to match up with official named malts. This whisky was bottled at 40%, probably with coloring and chill filtration. Nose: initially very muted and blend-y - eventually sherry, oak, baking spices, herbal/green, vanilla, floral, cardboard malt, bubblegum. After adding a few drops of water a lot of honey and oatmeal come out, the oak becomes buttery, but it reads as more youthful and with less sherry. Taste: sherry sweetness throughout, apple/pear in the background around the middle, fading into bittersweet malt near the back. After dilution it becomes sweeter up front, with honey and malt overtaking the sherry, which comes back around the middle and joins more identifiable oak near the back. While not the most exciting malt, I think it accomplishes its intended task fairly well. Most buyers are going to pick it because of the age on the label and want something relatively easy drinking and unchallenging. I feel like it does a decent job competing with basic 18 year old malts from the likes of Glenfiddich and Glenlivet, but without the heavy oak component found in those that give them a sense of age. Given that it costs significantly less than the direct competition, these trade-offs seem perfectly acceptable. It loses some points for having some cardboard notes that I associate with tired casks, but that's kind of what you get at the price. While it doesn't have any caché like a malt from an identifiable distillery, once it's in the glass it does a very competent job. While there may not be very many OB Tobermorys, independent bottlers have created far more options. This particular one comes from one of the Laings' many different labels. For whatever reason, The First Editions happens to be particularly expensive in the States compared to Europe, which means that many of them have sat on shelves for years. This particular one was around for roughly five in Oregon until it and a large number of other releases from The First Editions were put on closeout. 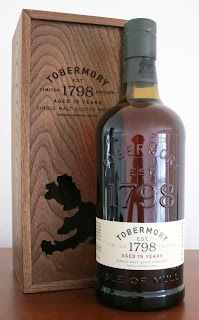 As a fan of Tobermory, I decided to give it a try. This whisky was distilled in 1995, filled into what was likely a refill hogshead, then bottled in 2012 at 54.1% without coloring or chill filtration. Nose: vanilla with a plastic edge, malty, herbal/vegetal, cedar-y oak, cold smoke/wet concrete in the background, cardboard funk and cabbage that blow off with time in the glass. After adding a few drops of water it becomes fairly simple and strongly malty with an herbal edge and some overripe fruit. Taste: cask strength malty sweetness beginning up front then fading towards the back, a touch of baking spices, gentle berries and herbal funk from the middle back, moderately tannic oak near the back. After dilution the sweetness becomes stronger, but the middle turns into a malty muddle with more tannic oak and berries. This is why people don't like Tobermory. Especially when I opened the bottle the funk was somewhat overpowering and made it a less than totally pleasurable experience. Since it has been open for a while and probably evaporated a bit the funk has come more in balance, but it takes time to become an engaging whisky. The OB 10 Year, which can also be difficult going for a while, is ultimately far more approachable because the first-fill casks help to grind off some of the more rough edges. While not especially exciting, this strength is extremely drinkable. The Tobermory funk keeps it from being too boring without being overly assertive. This would have done just fine as an Old Malt Cask bottling. This is... not good. While some of this character was detectable at full strength, dilution overwhelms whatever merits the malt had before. The finish is the only half-way acceptable part and that is absolutely damning with faint praise. I do not recommend adding too much water. Until fairly recently, Tobermory tended to fly under the radar. Even now, Ledaig captures more of the attention as malt fans seek peated whisky that isn't wildly expensive (yet). It wasn't helped by the fact that their lineup was rather limited, with only a 10 Year and a 15 Year expression. Further complicating the situation, while the entry-level 10 Year was priced in line with other basic single malts around $50, the 15 Year was wildly out of line with the market at $120 and up. While some of this is justified by the fact that the sherry cask finishing for the 15 Year is carried out at the distillery, which has extremely limited warehouse facilities since they were sold off in the 1970s and turned into apartments, that still makes it difficult to justify a price point nearly double that of most other distillery's 15 year old releases. Yes, it also comes in a very fancy box, but as with many other whisky fans, I would gladly forgo the packaging if it cost me less. I can't drink a box. This whisky was aged in ex-bourbon casks primarily at Deanston for at least 14 years, then finished in Gonzalaz Byass oloroso sherry butts at Tobermory for at least an additional year, then bottled at 46.3% without coloring or chill filtration. Nose: rich, dry sherry, juicy raisins, leather, dark chocolate, floral berries, grapefruit peel, gentle herbal malt in the background, toasty oak, vanilla. After adding a few drops of water it stays about the same, but the malt becomes a little more prominent to give it more balance. Taste: bittersweet sherry and undergirding oak throughout, muddled fruit-y overtones in the middle, and an herbal malty fade at the back. After dilution the malt becomes stronger at the back. While I enjoyed this, I felt like the sherry cask finish was too strong for my taste. I might enjoy this expression more if it was constructed like Bunnahabhain with a small percentage of first-fill sherry casks mixed with a larger number of ex-bourbon and refill sherry casks to give better balance between the sherry and spirit. As is, I'm not sure this is worth what I paid for it at closeout prices, let alone at MSRP. While I'll be looking for other sherried Tobermory bottles in the future, I've had enough of this one.